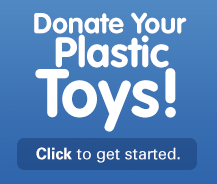 We have developed a variety of free program materials to help you promote awareness of your toy collection. These tools can be edited to accomodate your program details. Check them out so you can take your collection to the next level for impact and results. Have fun!! Use these step-by-step guidelines to help you plan ahead and get your collection started. Fill in your collection details by writing into the blank fields on our SCT Collection Flyer. Then print and hang them up in highly visible areas to promote your toy collection. *Note: You can even screen shot the flyer and save it as a picture file to post on your social media platforms! Print and cut out these SCT hang tags to write thoughtful messages or draw pictures on the back for the recipient children. Once you’re done decorating the tags, tie them to your favorite toys before they are delivered to your assigned recipient organization. *Message Examples: Hope you enjoy this toy! -- Happy Earth Day! -- Have fun! --Happy Holidays! Choose the printable activity booklet for Earth Month or Holiday. Then print it out and share it with your children or students. This is a great way to foster the 'teachable moments', especially in conjunction with a collection or donation of toys, about the important life lessons around 'doing good' and 'being green'. Use this fun coloring sheet of Second Chance Lance, our lovable robot mascot, to engage your children on the importance of reuse, donating to others less fortunate and keeping toys out of our landfills. Take your efforts a step further and get the word out to your local communities! Download and fill out our SCT Press Release to announce your donation of toys to the recipient organization. Then send it to local newspapers, blogs, community calendars and/or give this to any TV that show up at your collection or donation. If you are a school collector, please use these morning announcements a few days before your collection to remind the students about your event. It will help to get them excited and will serve as a reminder so they have ample time to bring in their toys from home. You can use these media advisories to send to your local radio, TV, and print media to announce your efforts with hopes of them covering your collection or donation event! *Note: You will need to clear this with your recipient organization before inviting the media to cover the donation of toys at their site, especially when children are involved.